There are many fantastic romantic getaways in Pittsburgh PA to choose from. Pittsburgh is the heart and soul of southwestern Pennsylvania, where romance lives and gives new life to an unlikely destination that many people might not consider among the most obvious romantic getaways. Actually, lovers have happily been attracted to Pittsburgh for quite awhile. Though Pittsburgh may not be among the most famous places on the planet for romance, it is still nonetheless one of the greatest romantic vacation spots in Pennsylvania. The city and surrounding countryside is picturesque and ideal for honeymoons, anniversaries, or any other excuse you may need for a romantic rendezvous. Many Pennsylvania bed and breakfast inns are available to choose from, and Pittsburgh has some of the most magnificent romantic getaways in the entire state. Here are some of the most popular romantic getaway options in Pittsburgh. The Inn on Negley is a romantic and luxurious little inn situated in the historic area of Shadyside. This charming Inn has many amenities to enjoy with your sweetheart, including large Jacuzzi tubs in the rooms and comfortable canopy beds. The Omni William Penn Hotel is one of the most famous and legendary hotels in Pittsburgh. This prestigious hotel is luxurious and perfectly located in the heart of downtown Pittsburgh. A world class spa at Nail Galleria, fine dining, culture, theatre, and some of the most romantic spots in the city are all within close proximity. Overlooking the picturesque Allegheny River and located in the heart of Pittsburgh's cultural center, The Renaissance Pittsburgh Hotel is a romantic hotel with an unprecedented and historic setting. the hotel was built in 1906 and offers a great location, ideal for strolling to and from spots in the city. Inn on the Mexican War Streets might sound like a strange name for a romantic getaway, but don't let the name dissuade you. The inn is actually a mansion which has been renovated to accommodate guests searching for romance and history. Situated in a great cultural and historic location of the city, Inn on the Mexican War Streets offers a charming ambiance in an unconventional mansion setting. This Pittsburgh getaway glows with enchantment, even serving chocolate chip cookies every morning. Though the city is full of romantic majesty and culture, many people prefer something special and different. Many romantics are looking for an escape near Pittsburgh, and here is where you will find some of the most notable getaways in the entire state. The Greenbrier is one of the most romantic and luxurious getaways in the world. It is also one of the most expensive in Pennsylvania. The Greenbrier is the closest major resort to Pittsburgh, situated within an easy drive from the city. This resort has the privilege of being located over a secret, albeit luxurious, underground bunker created to keep congress and the essential members of the United States government safe in the event of a nuclear attack. This romantic resort has it all. Fine gourmet dining is exceptional, with world class golf and all the amazing amenities you would expect from a top of the line resort. Nestled in the scenic Allegheny Mountains just across the state line in White Sulphur Springs, West Virginia, there is simply nothing like this in the entire area. 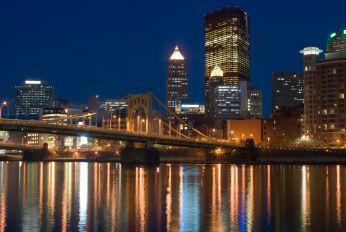 Pittsburgh is a beautiful destination and there are certainly many romantic getaways in Pittsburgh PA to choose from. Look for travel deals around the holidays, especially Valentine's Day. Just keep in mind that though Pittsburgh is romantic in its own way every day of the year, the weather can change dramatically from one season to the next. Winter activities are entirely different than summer activities, but lovers will appreciate the charm no matter when they decide to visit.